Vista Outdoor Selling Giro & Guns? The Giro and Blackburn boycott may not need continue much longer if their parent company Vista Outdoor is successful in unloading all these brands along with their gun business. They’re apparently, trying according to a story on The Motley Fool. Between outdoor products and shooting sports, Vista has grown to a company with some 50 brands in its portfolio, and when times were good, they helped create a diversified business that boosted its stock to record highs. But the past year-plus has not been kind to the gun market and supporting businesses, and Vista felt firearms no longer fit into its core strengths, because they will require large investments to turn them into a growth business. Hmmm, who would want their cycling brands? Maybe Pon Holdings? They have BBB, but a little Giro/Blackburn/Bell, couldn’t hurt, right? Would be nice if someone could breathe some new life into them. We took the original Mach 429 Trail, completely reshaped the chassis and gave the bike a truly progressive geometry. The new Trail 429 is even more capable on technical terrain than its predecessor yet doesn’t sacrifice a thing in the quick and nimble departments. 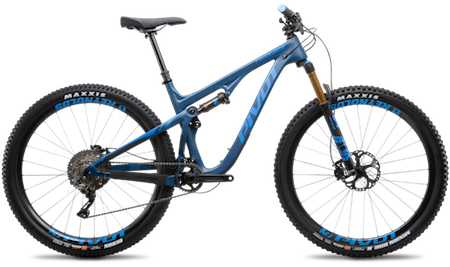 . . Effortless handling, incredible power transfer and blazing acceleration are what set the Trail 429 apart from so many other trail bikes. Okay. We get it. It’s a 429 Trail. Exactly what most of the MTB riders we know are looking for. For all the details, click the link.